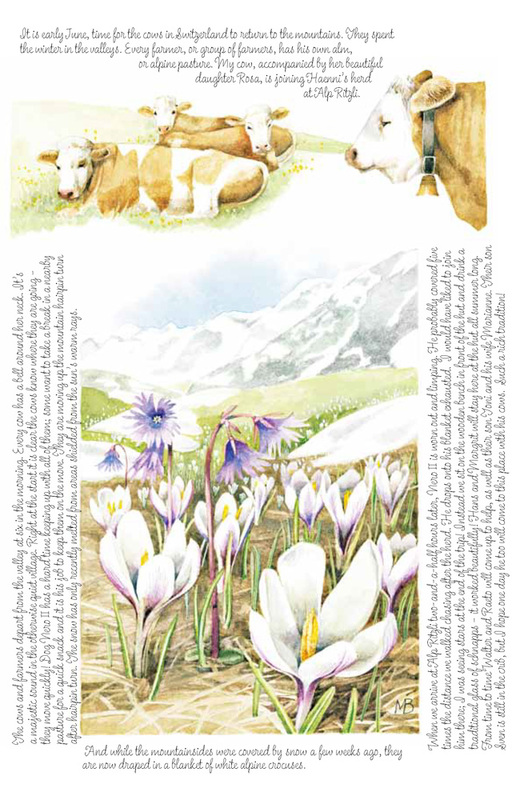 It is early June, time for the cows in Switzerland to return to the mountains. They spent the winter in the valleys. 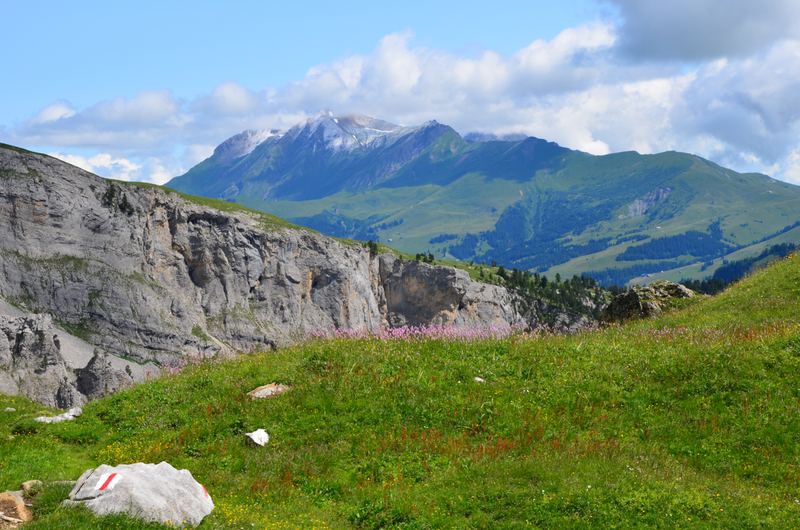 Every farmer, or group of farmers, has his own alm, or alpine pasture. My cow, accompanied by her beautiful daughter Rosa, is joining Haenni’s herd at Alp Ritzli. The cows and farmers depart from the valley at six in the morning. Every cow has a bell around her neck. It’s a majestic sound in the otherwise quiet village. Right at the start it is clear the cows know where they are going – they move quickly! The dog, Nero II, has a hard time keeping up with all of them, some want to take a break in a nearby pasture for a quick snack and it is his job to keep them on the move. They are moving up the mountain hairpin turn after hairpin turn. The snow has only recently melted from areas shielded from the sun’s warm rays. 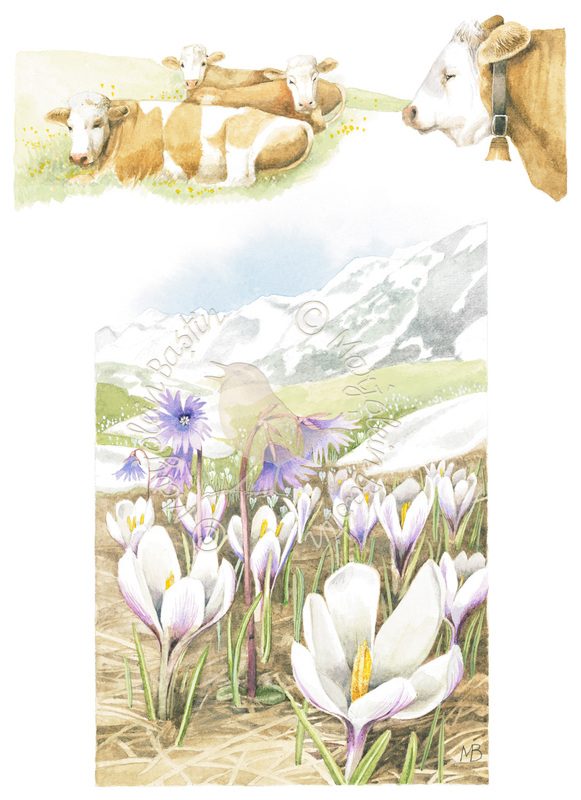 And while the mountainsides were covered by snow a few weeks ago, they are now draped in a blanket of white alpine crocuses. When we arrive at Alp Ritzli two-and-a-half hours later, Nero II is worn out and limping. He probably covered five times the distance we walked chasing after the herd. He drops onto his blanket exhausted. I would have liked to join him there; I was seeing stars at the end of the trip! Instead we sit on the wooden bench in front of the hut and drink a traditional glass of schnapps – it worked beautifully! Hans and Margrit will stay here at the hut all summer long. From time to time Walter and Raeto will come up to help, as well as son Toni and his wife Marianne. Their son Sven is still in the crib, but I hope one day he too will come to this place with his cows. Such a rich tradition!